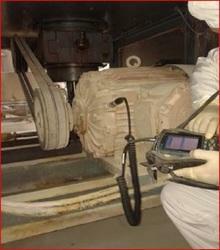 Envicon is rendering quality Condition Monitoring Services for predictive maintenance. Envicon not only provide the condition monitoring assignments but also assists industries in implementing it by training their engineers. We undertake condition monitoring services for shipboard rotating equipment on a turnkey basis that serve to identify the correct time that an equipment needs to be overhauled. This significantly reduces the mean time between overhauls and thereby consumption of new spares. We integrate Sensors, IOT Platform, Analytics and Business Intelligence to give a one stop solution to all client needs. The intelligent insights and analytics you gather about your assets using our M2M platform and solutions enables planning preventive and predictive maintenance in an optimized manner thereby providing excellent savings and delighted customers. Our company has created niche in offering Predictive Maintenance Service to the clients. The service provider offering this service as completely tailored as per the demands of customers. The service provider provided this service in accordance with established standards and guidelines of the industry. Gamesa has developed its own system of predictive maintenance (Gamesa SMP) for the early detection of potential deterioration or faults in the principal components of wind turbines. - Reduction in major corrective measures. From our wide range of services, we are indulged in providing Predictive Maintenance Service. Making use of modern techniques, these maintenance services are offered specifically and are mostly valued due to their reliable nature and uniqueness. Our company has mastered the art in providing Predictive Maintenance Service. Our company has been acknowledged in providing Predictive Maintenance Service. PdM is an integral part of a total plant improvement program, configured to eliminate factors that limit plant effectiveness. PdM's are just not to anticipate breakdowns and schedule corrective maintenance task. Maintain your equipment at peak efficiency. Predictive Maintenance goes to the very heart of your equipment operations. We know it’s not enough to perform preventive maintenance services on equipment, because it doesn’t give you any real insight about how your equipment is performing, and downtime can strike at any time. Ever wished for a crystal ball This unique suite of IBM products uses data to help reliability engineers predict when critical equipment might fail so they can take the appropriate action. Being understood the importance of maintenance on electrical & mechanical we provide a dedicated team to prepare a chart on preventive and predictive maintenance to carry out without any interruption to the end users. By also maintaining adequate stock of materials for replacements, we reduce the downtime on rectification works if the unit malfunctions. Constantly monitor health of critical assets, calculate likelihood of failure and notify deterioration to relevant service personnel.